To obtain a copy of the spreadsheet file itself, click here. The version of linear exponential smoothing that will be used here for purposes of demonstration is Brown’s version, merely because it can be implemented with a single column of formulas and there is only one smoothing constant to optimize. Usually it is better to use Holt’s version that has separate smoothing constants for level and trend. The forecasting process proceeds as follows: (i) first the data are seasonally adjusted; (ii) then forecasts are generated for the seasonally adjusted data via linear exponential smoothing; and (iii) finally the seasonally adjusted forecasts are "reseasonalized" to obtain forecasts for the original series. The seasonal adjustment process is carried out in columns D through G.
Note that the moving average typically looks like a smoother version of the seasonally adjusted series, and it is shorter on both ends. Another worksheet in the same Excel file shows the application of the linear exponential smoothing model to the seasonally adjusted data, beginning in column G.
The errors are computed in the next column (here, column J) by subtracting the forecasts from the actual values. The root mean squared error is computed as the square root of the variance of the errors plus the square of the mean. (This follows from the mathematical identity: MSE = VARIANCE(errors)+ (AVERAGE(errors))^2.) In calculating the mean and variance of the errors in this formula, the first two periods are excluded because the model does not actually begin forecasting until the third period (row 15 on the spreadsheet). The optimal value of alpha can be found either by manually changing alpha until the minimum RMSE is found, or else you can use the "Solver" to perform an exact minimization. The value of alpha that the Solver found is shown here (alpha=0.471). The autocorrelations at lags 1 to 3 are very close to zero, but the spike at lag 4 (whose value is 0.35) is slightly troublesome--it suggests that the seasonal adjustment process has not been completely successful. However, it is actually only marginally significant. 95% significance bands for testing whether autocorrelations are significantly different from zero are roughly plus-or-minus 2/SQRT(n-k), where n is the sample size and k is the lag. Here n is 38 and k varies from 1 to 5, so the square-root-of-n-minus-k is around 6 for all of them, and hence the limits for testing the statistical significance of deviations from zero are roughly plus-or-minus 2/6, or 0.33. 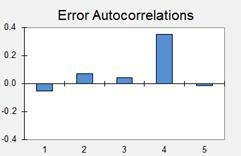 If you vary the value of alpha by hand in this Excel model, you can observe the effect on the time series and autocorrelation plots of the errors, as well as on the root-mean-squared error, which will be illustrated below. The projected long-term trend is now negative rather than positive! With a smaller value of alpha, the model is placing more weight on older data in its estimation of the current level and trend, and its long-term forecasts reflect the downward trend observed over the last 5 years rather than the more recent upward trend. This chart also clearly illustrates how the model with a smaller value of alpha is slower to respond to "turning points" in the data and therefore tends to make an error of the same sign for many periods in a row. Its 1-step-ahead forecast errors are larger on average than those obtained before (RMSE of 34.4 rather than 27.4) and strongly positively autocorrelated. The lag-1 autocorrelation of 0.56 greatly exceeds the value of 0.33 calculated above for a statistically significant deviation from zero. As an alternative to cranking down the value of alpha in order to introduce more conservatism into long-term forecasts, a "trend dampening" factor is sometimes added to the model in order to make the projected trend flatten out after a few periods. The final step in building the forecasting model is to "reasonalize" the LES forecasts by multiplying them by the appropriate seasonal indices. Thus, the reseasonalized forecasts in column I are simply the product of the seasonal indices in column F and the seasonally adjusted LES forecasts in column H.
It is relatively easy to compute confidence intervals for one-step-ahead forecasts made by this model: first compute the RMSE (root-mean-squared error, which is just the square root of the MSE) and then compute a confidence interval for the seasonally adjusted forecast by adding and subtracting two times the RMSE. (In general a 95% confidence interval for a one-period-ahead forecast is roughly equal to the point forecast plus-or-minus-two times the estimated standard deviation of the forecast errors, assuming the error distribution is approximately normal and the sample size is large enough, say, 20 or more. Here, the RMSE rather than the sample standard deviation of the errors is the best estimate of the standard deviation of future forecast errors because it takes bias as well random variations into account.) The confidence limits for the seasonally adjusted forecast are then reseasonalized, along with the forecast, by multiplying them by the appropriate seasonal indices. In this case the RMSE is equal to 27.4 and the seasonally adjusted forecast for the first future period (Dec-93) is 273.2, so the seasonally adjusted 95% confidence interval is from 273.2-2*27.4 = 218.4 to 273.2+2*27.4 = 328.0. Multiplying these limits by December's seasonal index of 68.61%, we obtain lower and upper confidence limits of 149.8 and 225.0 around the Dec-93 point forecast of 187.4. Confidence limits for forecasts more than one period ahead will generally widen as the forecast horizon increases, due to uncertainty about the level and trend as well as the seasonal factors, but it is difficult to compute them in general by analytic methods. (The appropriate way to compute confidence limits for the LES forecast is by using ARIMA theory, but the uncertainty in the seasonal indices is another matter.) If you want a realistic confidence interval for a forecast more than one period ahead, taking all sources of error into account, your best bet is to use empirical methods: for example, to obtain a confidence interval for a 2-step ahead forecast, you could create another column on the spreadsheet to compute a 2-step-ahead forecast for every period (by bootstrapping the one-step-ahead forecast). Then compute the RMSE of the 2-step-ahead forecast errors and use this as the basis for a 2-step-ahead confidence interval.